Vessel operators are advised that a Special Event pursuant to Section 12(2) of the Marine Safety Act 1998 is to be held on the Murray River near Moama between 6:00am and 7:00pm on Saturday 9 and Sunday 10 February 2019. 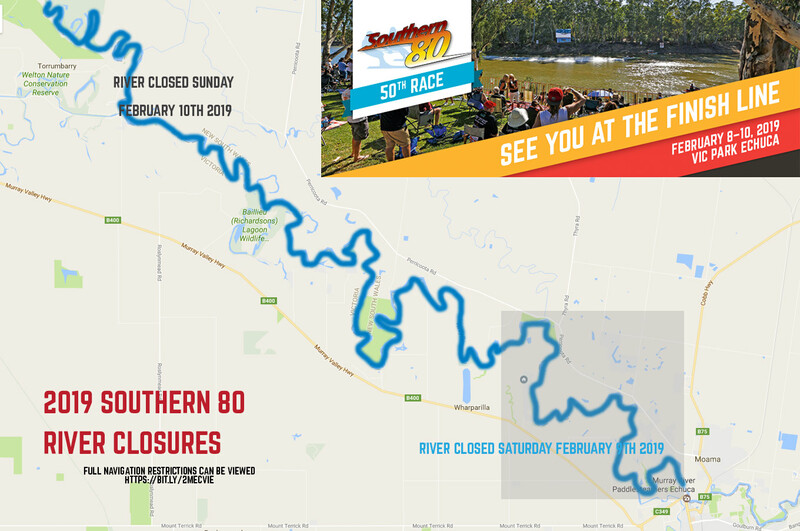 Due to the potential to affect the safety of navigation, Roads and Maritime has granted an Exclusive Use Aquatic Licence to the Moama Water Sports Club Ltd. to conduct the event and an Exclusion Zone (‘the Zone’) will be established on the entire width of the Murray River, near the towns of Moama – Echuca, between the above times and dates as specified below. From the Perricoota Marina, at the 1690km river marker, and upstream to the Victoria Park boat ramp, Echuca, at the 1712km river marker. From the Torrumbarry Weir, downstream of the 1630km river marker, and upstream to the Victoria Park boat ramp, Echuca, at the 1712km river marker. No unauthorised vessels or persons may enter the Zone between the specified times. Vessels that are lawfully moored or secured to the riverbank within the Zone at the commencement time may remain in the Zone pursuant to the Special Restrictions below, but may not be operated. The Zone will be marked at each end by buoys, local signage, and official vessels. Vessels moored or secured to the riverbank within the Zone must remain at their position, must be in a safe location well away from river bends and corners and MUST NOT be operated during the event. Any vessel determined to be moored or secured unsafely must be moved (for the duration) in accordance with any directions of an authorised officer or event official. Any vessel not moored or secured to the riverbank (i.e. merely anchored) is to be secured in accordance with the directions of an authorised officer or event official for the duration of the event. All vessel operators and persons in the vicinity must comply with the above restrictions, keep a proper lookout, exercise caution and keep well clear of participating race vessels and persons, and any support vessels. Houseboats are generally required to be orientated parallel to the riverbank and at the direction of an authorised officer or event official. Occupants of vessels moored or anchored within the Zone are strongly urged to vacate their vessels during the event, and if they wish to view the race to do so from shore. Vessels and persons in the vicinity of the Zone should exercise extreme caution and be aware of approaching race vessels and likely exit routes. Do not swim along or across the river, or swing or climb from trees along the river’s edge, as it is inherently dangerous and will cause the race to stop. Failure of vessel operators and persons to comply with the above directions may cause the race to be delayed or stopped. a) Persons within the vicinity of the Exclusion Zones must comply with any directions given by a Boating Safety Officer or Police Officer in relation to the Special Event or to marine safety. Failure to comply with any such direction is an offence (Marine Safety Act 1998, s.15A – Maximum Penalty $3,300.00). For further information concerning this Navigation Advice, please contact the RMS (Maritime) Infoline 131 236 or visit the Maritime web page.